I had arrived home on a redeye on a Saturday morning, hours after my father died. After a 12 year battle with leukemia he finally gave in, and I never got to kiss him goodbye. I always promised my father that I would pursue a master's degree. Although my efforts were constantly postponed due to complications with his health, in 2013 I finally moved to LA to pursue my MBA. 7 months in I was involved in an almost fatal motorcycle accident, which resulted in the amputation on my left leg below the knee. The following two years were charged with both physical and psychological struggles, but thinking about my dad and the fight he endured for 12 years made me put things in perspective; I was willing to overcome whatever challenges I would face moving forward. I had yet to receive my prosthesis when I first found Team In Training, and fundraising for The Leukemia and Lymphoma Society while training for a half marathon made so much sense to me. I was even more focused on my recovery, on getting back to running and helping to find cures for blood cancers. In November 2016, the year I was cleared by my doctors to run again, I completed my first half marathon with Team In Training in memory of my father. 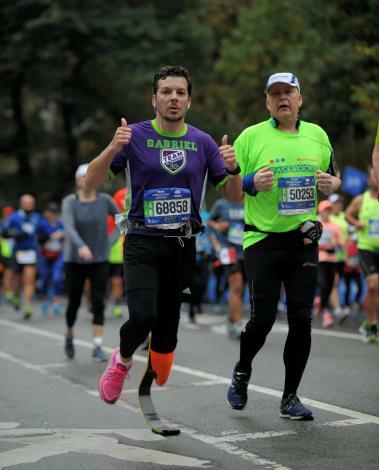 This year I completed the NYC marathon. Each mile was dedicated to someone who lived through or was experiencing the hardships of a life with blood cancer. The Leukemia & Lymphoma Society (LLS) is the world's largest voluntary health agency dedicated to blood cancer. The LLS mission: Cure leukemia, lymphoma, Hodgkin's disease and myeloma, and improve the quality of life of patients and their families. LLS funds lifesaving blood cancer research around the world and provides free information and support services.